Mozambicans love their chicken. But in 2005, there was a good chance that the galinha found in Mozambique supermarkets was imported illegally after sitting in Middle Eastern supermarkets for a year or more. Domestically produced poultry accounted for only a third of the market. TechnoServe saw an opportunity to promote economic growth by developing the poultry industry, launching a comprehensive program in 2005 that brought together public and private partners. Last week, a delegation from the Mozambican poultry industry visited Washington to describe the tremendous impact of this program. Mozambicans love their chicken. But in 2005, there was a good chance that the galinha found in Mozambique supermarkets was imported illegally after sitting in Middle Eastern supermarkets for a year or more. Domestically produced poultry accounted for only a third of the market. TechnoServe saw an opportunity to promote economic growth by developing the poultry industry, launching a comprehensive program in 2005 that brought together public and private partners. Last week, a delegation from the Mozambican poultry industry visited Washington to describe the tremendous impact of this program. 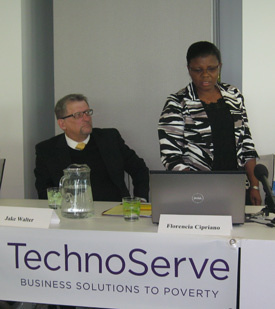 TechnoServe’s industry development program helped build the capacity of Mozambican farmers, companies and government agencies. With support from the U.S. Agency for International Development and U.S. Department of Agriculture, TechnoServe promoted training for small producers across the country. In partnership with Cargill, TechnoServe helped strengthen the public veterinary service, contributing to improved animal health and a safer food supply. The poultry program supported the creation of an industry association called A.M.A. to give domestic producers a unified voice. TechnoServe worked with A.M.A. to recommend import requirements that would protect health and safety but not constitute a restraint of trade; the Mozambican government implemented those recommendations. A.M.A. launched a popular advertising campaign that helped domestic companies capture a greater share of the market, even as poultry consumption increased by an annual average of 40 percent. As a result, poultry grew to a $160 million industry in Mozambique in 2009, compared to $25 million in 2005. The industry has helped create more than 90,000 jobs, including tens of thousands of small-scale farmers who produce soy and corn for poultry feed. Hundreds of thousands of Mozambicans are living better lives thanks to the industry’s growth – eating healthier diets, accessing health care, sending more children to school. Funding for the poultry program ends in March, but the industry’s progress will continue. At a Feb. 8 panel discussion in Washington, D.C., TechnoServe’s Mozambique country director, Jake Walter, said domestic companies are beginning to attract outside investors, including U.S. firms. The industry’s development is a testament to the Mozambican men and women who have stepped up to take their future in their own hands.